A few weeks ago, I lost my mobile phone. I won’t go into the circumstances (OK, I’d been out, I’d had a drink, it was 100% my own fault) but it was gone. Fortunately perhaps, I am not a fancy phone person. I’ve never had a brand new phone. I’ve been on the same contract with Three Mobile for about 14 years; it cost me £5.70 a month until last week when I took the daring decision to double my mobile internet for an extra three quid, because quite frankly running out of data halfway through the month was getting annoying. I buy a cheapish phone outright and then use it until my toddler submerges it, smashes it or (apparently) I lose it. I have never had ownership of two working smartphones at any point; I’ve never upgraded. My last phone was a Huawei Honor 7. It was alright. Although I didn’t use it much for taking photographs as the picture quality was not really up to scratch for blog photography, I still very much missed not being contactable. I couldn’t face soft play without it. Life just wasn’t the same. Just as I’d given up on finding it and had resided myself to my husband’s five-year-old iPhone 5 with a crack on the back and a sticky button, Three Mobile agreed to lend me an iPhone 7 plus for a few weeks to review. After using the iPhone 5, my only recent experience of Apple products, my opinion was that quite frankly it was slow, glitchy and annoying. The battery lasted less than two hours, the camera was rubbish and the amount of space was woeful. Suddenly having a decent phone changed everything. It was so quick! The screen size was great; I could get actual work done on it. The photos were amazing; no longer did I have to drag my DSLR everywhere on the off-chance that I might want to take a picture. The battery didn’t even have to be charged throughout the day. I’ll be exceptionally sad when I have to send it back and use the crap phone again. Then I was invited to the Three Discovery Store in London to play with the new iPhone 8 and 8 Plus and the new iOS update. The new iPhone 8 looks very much the same as the 7. 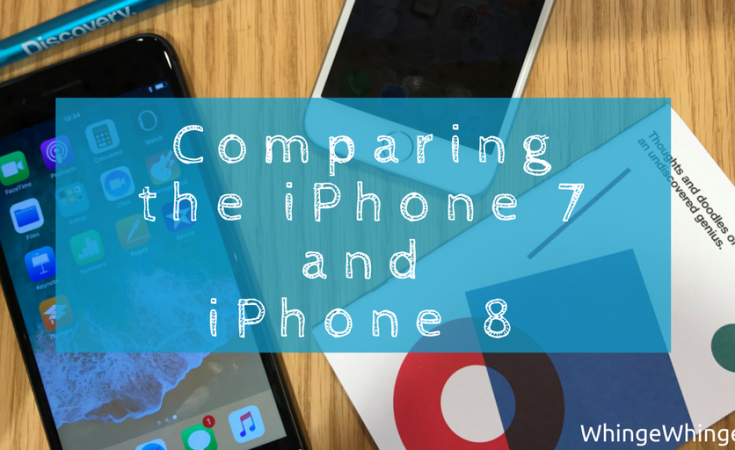 With my limited knowledge I couldn’t really tell the difference between the two except that the iPhone 7 is metal on the back and the 8 is made of glass. The size and weight is very similar. To someone used to using a much older phone I didn’t notice the improved processing speed, or the battery life which has also improved in this generation. It can be charged wirelessly, and it comes with 64GB or 256GB of storage which is significantly better than the 4gb I had on my iPod in the olden days. The ability to choose any portion of a ‘live’ photo. I’d never seen a live photo before I received the iPhone 7 plus and I was a bit concerned that I’d been accidentally taking videos instead until someone explained them to me. For the uninitiated, it basically takes a second of video footage before the photograph is taken. I said earlier this week that it was annoying you couldn’t choose which bit of the picture you want; my kids go from smiles one second to shut-eyed drooling loons the next. This sounds like an amazing update and I wish I could update to iOS 11 on the phone I’m borrowing! You can also save the image as a video, loop it or bounce it, like this! You have ‘portrait mode’ on the 7 plus which means when taking a photo of a subject you can blur the background of the photograph like a DSLR picture as above; the first is normal mode and the second is portrait mode. Clever no?! With the iOS update, you have more options in portrait mode; you are now able to choose a lighting mode (for example studio lighting) and even fade the entire background to black. It’s fun to play with and the results are remarkably professional. If you press the side button of your phone 5 times quickly (please don’t do it) it will call the emergency services as well as sending your location to your emergency contact. How clever is that? After a few weeks of using the iPhone 7 I am an Apple convert, or I would be if I could afford it. Sadly the price tag for the iPhone 8; around £700 for the 8 and £800 for the 8plus means that I might get my hands on it in around 5 years, by which time people will be controlling their mobiles with their thoughts and they’ll be embedded in their arms or something. In fact we even took a look at the iPhone X (by way of presentation, not in person as they’re not out yet) and it doesn’t even have a button and uses a retina scan to unlock it, so I might not be far off. You can learn more about Three Mobile’s range of iPhones here. I was invited along to this event by three but this write up is all my own words. Thank you to three for lending me the iPhone 7 plus; I am going to weep when I send it back. The photo quality on the 8/8 Plus is amazing, I'll absolutely be upgrading next year, or sooner if I can! It's so nice of Three to lend you the 7 to try out too!